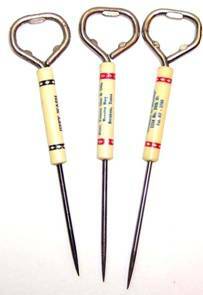 The handles of these tools are made of composite materials. They are grouped in the sections identified below. L = 7-3/8", the handle is a tapered diamond shape. L = 7-3/8", Unusually thin pick - 0.08" dia. The handles are shaped like a tapered oval. Tapered eight sided Bakelite handle. No ferrule. Very thin pick - 0.08" diameter. No markings. The handle is a tapered modified oval with slight bulges on the sides. I believe the handle is made of Bakelite. Chips in the end of the handle indicating the end of the handle may have been used to crack ice. No ferrule. No markings. L = 7-3/8", The handle is made from a Bakelite napkin ring. Have not been able to identify this ice pick configuration in any Bakelite document. It's believed to be a home adjustment. L = 8-1/4" when pick is encased and 8-1/8" when uncased. No markings. Comparison of the three different colors collected. All plastic handle and ferrule. No markings. All plastic handle and protective cover. No markings. Encased L - 8-1/4", Open L - 7-7/8", Metal ferrule. No markings. 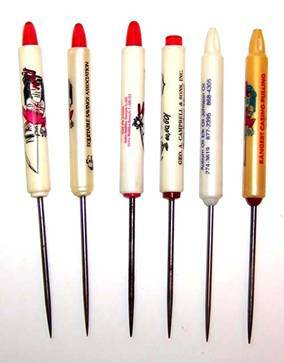 Ice pick tapered handle and a protective sleeve are made of plastic as is the yellow plug in the handle which retains the pick. No markings. L - 8-1/4", 1" compression, SPRING ICE PICK on one side of handle, NEW IDEA PAT. JAPAN on the pick near the handle. A on other side, handle screws apart and separates between the two colors for repairs. Plastic tapered handle with a rectangular hole near the end. No ferrule. No markings. SAF-PIC in raised lettering on the handle. Six sided handle. Save METZ BEER Coupons on one side and PAT PEND. SAF-PIC on the other side. All plastic except the pick. Markings - MIDWEST ICE CO. on the handle. Three tabs on the cap lifter. 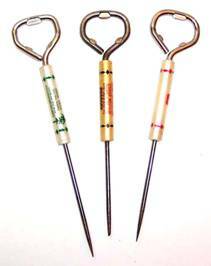 Pick stows in handle, Cap lifter on end of handle, three tabs on cap lifter. C B ANDERSON CO., Electrical Equipment, Tulsa, O. C., Amarillo, Lubbock, Wichita on the handle. L = 9-1/4", GREENFIED LIQUOR SHOP 259-8786 stenciled on the handle. L = 9-3/4", Small hole in the end of the handle for hanging when no tin use. No markings. Lengths very from 6-3/4" to 7-1/4". Cream back ground with difference colored bands around the ends of the handle. The one to the left has black bands with diamond shaped openings whereas the one has red bands with same openings. The one in the center differs from the one on the right in that it has a red dot in the center of each diamond opening in the bands. All three have different advertisements. The handles are slightly over 1/2" in diameter. Lengths vary from 7-1/8" to 7-1/2". 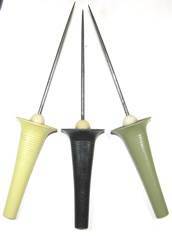 Each has a different tip configuration on the end of the handle and/or at the handle/pick interface. Each has a different marking and advertisement. Length 7-1/8". Green back ground handle with different color diamond shapes printed around the ends of the handle, one being black and the other red. Both cap lifters have three tabs. Each pick has a different advertisement. Lengths vary from 7-1/8" to 7-1/2".Cream and white back ground handles with different color diamond shapes printed around the ends of the handle, left to right - green, black and red. Each pick has a different advertisement. All cap lifters have three tabs and the same general shape with one on the left slightly sharper corners. .27 ea. .25 ea. .24 ea. L = 6-1/2" No markings. L = 6-3/8", No markings. Appears to be home made. L = 7-1/8", Shipmate STAINLESS ICE PICK LYMAN METAL PRODUCTS, NORWALK, CONN. And the emblem of a sail boat on the handle. 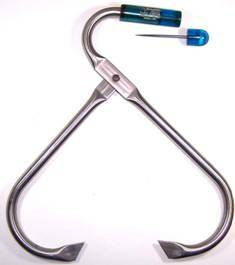 As shown below, the ice pick has a case for the pick and bracket for mounting to the wall or the side of an ice box. L - 4-1/8", No markings on the ice pick. The marking on the tong is described to the left. L = 6-5/8" - Top, L = 6-3/4", Middle, and L = 6", Bottom. Thin pick - 0.075" dia. Nestle and Logo of a face with a radiating head dress on each side of the rectangular shaped handle. Not sure of the function of the "U" shaped object on the end of the handle. It may have been used to open the cap on the Nestle Coca cans. There are no indications the bottom pick had the "U" shaped item on the end of the handle. L = 8-1/8", WINCHESTER, MADE IN USA on the handle. No ferrule. THE MCBEE COMPANY ATHENS, OHIO imprinted on the handle. Thin pick - 0.08" dia. Eight sided handle. Eight flats around the handle. Not sure of handle material. Steel ferrule, The pick is 0.10" diameter and 6" long. No markings. With such a long and thin pick, I wonder if this is an ice pick?